VOB is an old multimedia format as compared to MPEG-4. Thus, there are various limitations of the videos in VOB format on the modern digital devices and operating system. On the contrary, MPEG4 is widely popular as one of the latest multimedia format. VOB is supported in the DVD files while MPEG4 is compatible with all the types of portable devices, supports lots of codecs and can be streamed on the internet. 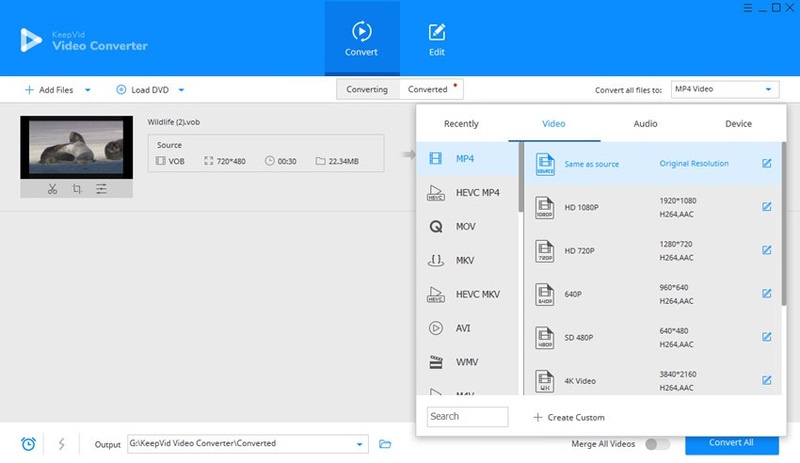 Due to the growing popularity of MPEG4 format over VOB, many users prefer to use online or desktop video converter programs for converting VOB format into MPEG4. KeepVid is on the top list of those converters and is greatly liked by the users. Conversion of the rare video format like VOB is possible with the help of KeepVid Video Converter. This video converter is available free of cost, you can download it on your device and start using it for converting videos. Add the videos by opening the videos in VOB file format and get them converted into MPEG4 format easily. Easy to use interface prevent any kind of hassles to the users for converting videos from VOB to MPEG4. KeepVid as VOB to MPEG-4 converter provides the high quality videos by downloading them from the suitable video websites. 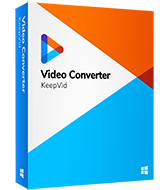 KeepVid Video Converter enables you to convert videos for desktop, mobile and online uses directly. It allows you to convert HD videos up to 4K. This video converter provides batch conversion to convert multiple videos at one time. It converts videos to more than 1,000 video and audio formats. It enables users to edit videos with many helpful features. Step 2. Select MPEG-4 as output, and click the Convert button to start converting VOB to MPEG-4. Download the software from official website and install KeepVid Video Converter. After getting started with it, add the VOB file by dragging and dropping, or clicking the Add Files button to add video from your computer. Choose MP4 as the output format in the drop-down menu by clicking the inverted triangle beside the Convert all files to option. 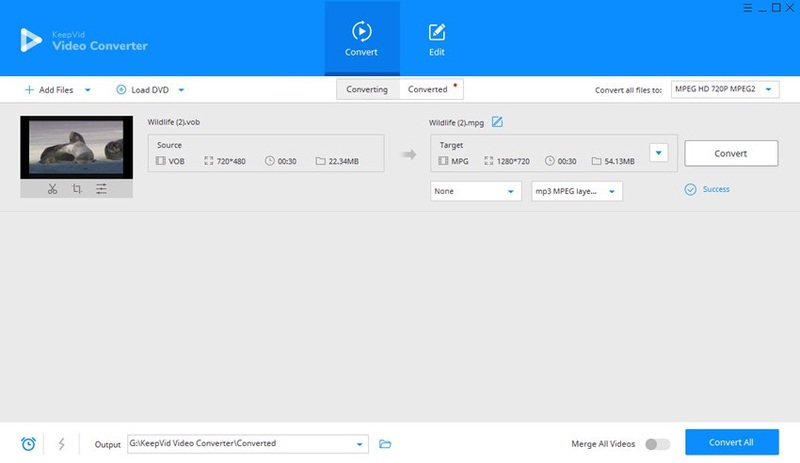 Click on the ‘Convert’ button to start converting VOB to MPEG-4. • You can customize the video before conversion by clicking the Pencil icon beside the output format. •	This video converter also enables you to download and convert videos in one click. KeepVid Online Video Converter: To convert VOB files into MPEG4 files, KeepVid is the best solution. 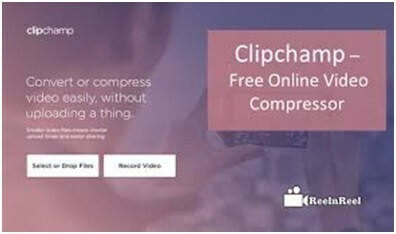 This is an online video converter which is able to convert the videos into many more file formats to make the videos compatible with different devices. It allows the users to visit the official web page to directly convert the videos into MPEG4. There is no hassle of software download to get the videos converted. It involves simple three step guide to convert the videos in MPEG4 or any other desired format. 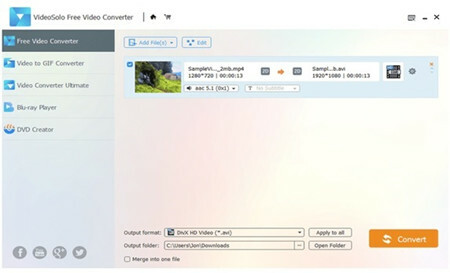 VideoSolo Free Video Converter: This is a free desktop video converter that is compatible with Windows and Mac devices. It supports various types of themes or plug-ins that makes it interesting for the users to convert the videos. This vob to mpeg4 converter is very fast in converting the videos in batch as well. Within few seconds, several numbers of videos can be downloaded, converted and saved at the desired destination. It supports more than 300 video/audio formats including MPEG-4. It offers the facility of batch conversion to save your time in converting videos one by one. 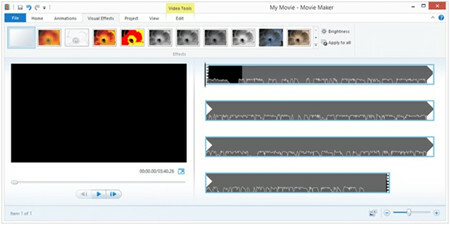 Windows Live Movie Maker: Movie maker is an integral part of the Windows Live suite which converts the videos from one format into the other and plays them on different types of devices. Videos can be added on this video format converter and then animations and visual effects can be added. This converter supports VOB, MP4, MTS, 3GP, WTV 3G2, ASF, M1V, AVI, K3G, MOV, M2T, M2TS, MOD, M4V, MPEG, MPG, MPV, VM, and WMV and many more input formats. It can be easily upgraded to provide new facilities to the users. Easy to download and install the software. It can download the videos from various video websites.